1st Time On The Market! This custom built, 2 bedroom plus a den with a downstairs family room and a half bath is located in the desirable neighborhood community of Riviera West in Kelseyville! 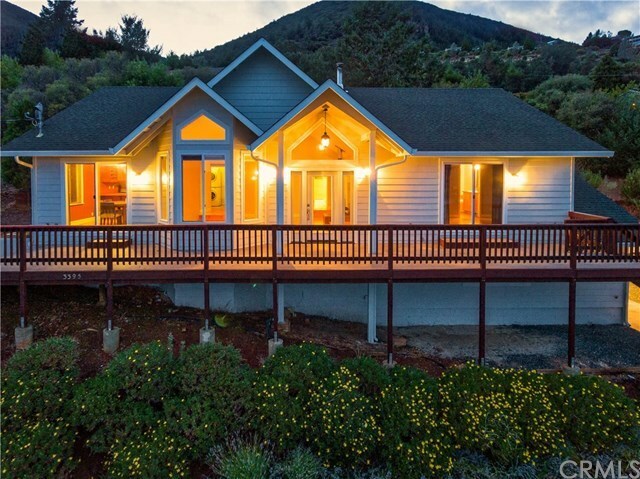 This home offers AMAZING lake and mountain views from every room! The property itself is almost a half acre, fully fenced with an automatic gate and has ample parking for guests or an RV and very private. Enter your new home from the front deck that overlooks the majestic beauty of Clear Lake. The living room has vaulted ceilings and a wood stove with stone surround. Step into the kitchen that features custom built birch cabinets and stainless steel appliances. The laundry room is located off of the kitchen and houses the on demand, tankless water heater and utility sink, it also acts as a mud room to the backyard. The Master Suite has it's own entrance and it's bathroom offers a jetted tub, separate shower and granite counter with double sinks. The family room has a wall lined with cedar and french doors to the parking area! Riviera West HOA offers Lake access from the Marina with a dock, pier, boat launch and lakeside picnic area. The seasonal heated pool and Clubhouse is located in the neighborhood just down the street from this home. Kelseyville is within a 3 hour drive from the Bay Area and Sacramento. This neighborhood is not far from shopping, dining, gas station and Wineries!